Send us your favorite family photo. 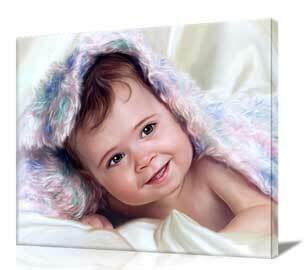 Order our $10 preview and a skilled Artist will turn your photo into a painting. 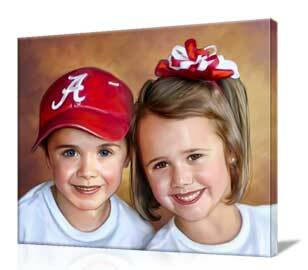 We'll send an email proof of the painted portrait within 1 to 2 days for review. You'll be able to view the artwork, make any changes and decide afterwards if you'd like to own the painting. 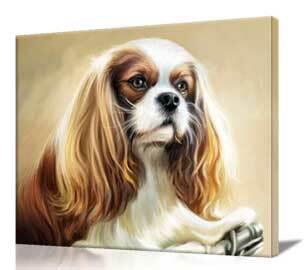 Visit our sample gallery and see what our Artists can do! First, we love our customers. Thats what you'll really want to know. 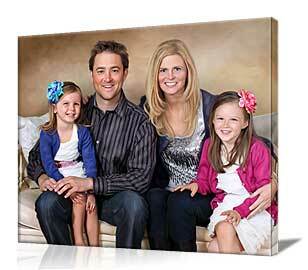 Whether we turn your picture into a painting or print your photo on canvas with gallery wrap....we guarantee your complete satisfaction. Since 2002 we've built our business around family...creating beautiful family portraits you might cherish forever. Your satisfaction is very important to us. We won't play games with pricing either. You won't see a price twice as high as it should be and then get a coupon for half off. Just good honest value from the start...the way it should be. "We had this photo taken at the beach by a professional photographer. But I had no idea how it would come to life turning my picture into a painting. The result is so ethereal now...like a memory really captured for the ages. I had no idea it would turn out this good for the price we paid. How did you do that?" "Susan was 11 when her Uncle took this picture. She wasn't even smiling. How can such an average picture turn into a painting like this? I really don't know what to say. Its just amazing. I'm going to tell everyone I know about your service." "Heard about you guys from a friend and sent you this good ol' photo of Dad and Mom. 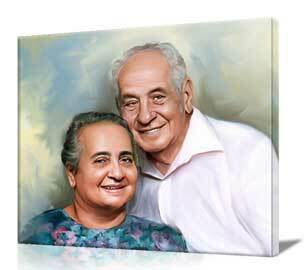 My Mother cried when I gave her this painting as a gift.Your Artists just captured the two of them so perfectly from the photo to the painting. I can't thank you enough." "I just received this amazing portrait as a gift from my very dear friend.I can not tell you how pleased I am with this painting. It is absolutely stunning and it takes my breath away every time I look at it, which is quite often. I lost my precious "Bentley" on July 4th but with this painting I feellike she is still here with me. Thank you again." "Just wanted to say thank you for a great job on our family portrait. You guys really made our Christmas more special. It was a work of art and I'll definitely be coming back for more. Great work and thank you guys again from the bottom of my heart." "I got my painted artwork today and I can't tell you how much I love it.You did a fabulous job. I had no idea you could turn a photo into a painting like this. It's incredible. Thank you so much. " 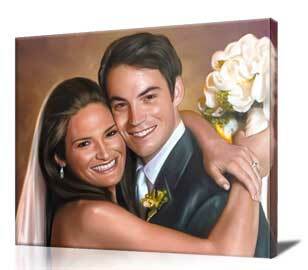 "The painting of Danny and I made from a picture on our Wedding day is just absolutely amazing. This is an artwork made from my own life and memories and I will truly cherish it forever. " "Yes !!! 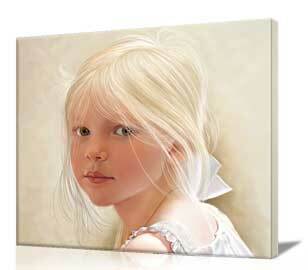 I would absolutely love for you to include the stunning painting of my grand daughter in your new customer showcase. I simply cannot thank you enough for the beautiful painting you created from my photo. I will certainly use your services in the future. Thank you and god bless." It wasn't long ago that a commissioned portrait created by a professional Artist was the province of the rich. But now you can give this gift in increments starting as low as $100. Create a gift certificate here and send by email to your recipient within 15 minutes. Or send the certificate to yourself for printing on your home computer. 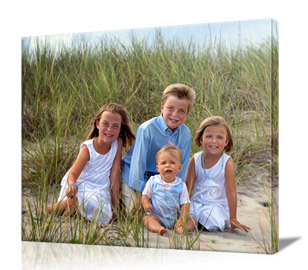 Your recipient will be able to use the gift credit to print a favorite photo on canvas, turn a picture into a painting or restore an old family photo. We believe in giving back to the communities we serve. If you're planning a fundraiser for school, church, dog rescue or anything else worthwhile in your community....please let us know. Give us as much detail as possible so we can understand what your goals are. For those efforts we can verify...we'll extend our hand to help in your fundraising effots. Our Affiliates earn up to 25% ! Most sites on the internet offer affiliate commissions between 10 to 20%. Why is that ? Its your hard work and reputation that brought the customer in. > What is Photo painting?